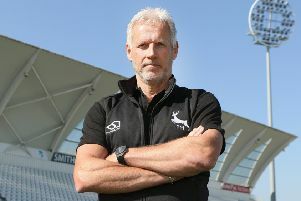 Notts Outlaws need to rediscover some of their finest form if they are to ensure qualification for the quarter final stages of the Vitality Blast competition. The defending champions have been inconsistent during their first eight matches in the North Group, winning four times and losing four, leaving themselves with work to do, starting with home matches against Derbyshire Falcons and Worcestershire Rapids. It has been a frustrating T20 campaign for their loyal fan base, thus far, with last weekend being a good example of how their form has lurched from one extreme to another. On Friday evening the Outlaws played to the top of their form and swept aside group leaders Lancashire Lightning, only for them to slump to defeat against Durham, with a sub-par performance, 24 hours later. Notts have been fancied in some quarters to rewrite history this season, with no team having ever defended the domestic T20 crown. Last season’s winners have more pressing needs right now, with their almost annual spot in the last eight under threat. With six qualifying matches left, it’s time to stand up and be counted, according to Mullaney. “We’ve got nobody else to blame; nobody else feels sorry for you in this sport,” he said. “The bottom line is, we’ve got six games to go in the group and if we win four or five we’ll get through to the quarter final. Notts have reached the knock-out stages in seven of the last eight seasons and will be hoping that recent history against the Falcons will see them return to winning ways. Their victory at Derby last month was the fifth straight time that they had defeated their closest rivals – and the seventh win in the last eight meetings. Trent Bridge crowds have again been fantastic this season, with around 50,000 fans having watched the four home Vitality Blast matches – and big crowds are again expected for the visit of their near-neighbours on Thursday evening and the Rapids on Saturday.